GCM Resources at Phulbari: perseverance or perversity? Directors come and go with great speed at GCM Resources. Executive Chairman Datuk Michael Tang has held on since June 2013 but Dato’ Md Wira Dani Bin Abdul Daim, appointed in October 2013, resigned in August 2016, apparently for ‘personal reasons’. Guy Elliott lasted from June 2013 to September 2015. Now there’s Nik Raof Daud, who joined in September 2015. I wonder how long he’ll last. Joining Michael Tang and Nik Raof Daud on the directors’ table at the company’s AGM was the new Finance Director, James Hobson, appointed last month – and if he’s got any sense, he’ll have an exit strategy. He was introduced as a man with a background in international development, which became an issue later on in the meeting. Chief Operating Officer Gary Lye joined by skype from Dacca, Bangladesh. Apart from them, there were only fifteen people in the room at the rather opulent Royal Aeronautical Society in London’s West End – and that included the security guards who, I think, were only there to look after those of us there from Phulbari Solidarity Group and London Mining Network. 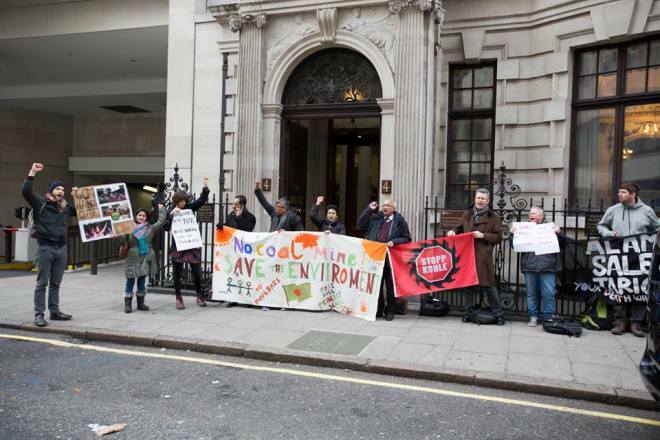 There was a great deal more action outside the AGM, where Phulbari Solidarity Group and the National Committee to Protect Oil Gas and Mineral Resources, UK Branch, had organised a very vocal demonstration. Inside, company Chairman Michael Tang kicked off by explaining that the company has been pursuing approval of its Phulbari open cast coal project with the Government of Bangladesh for many years. Its strategy is to present the project in a way which meets needs of the government, which has been steadfast in its determination to increase the national energy sector, mainly through coal generation. The government is leaning towards government to government contracts to develop power plants. If GCM presents the project in this way it is more likely to get approved. Its recent Memorandum of Understanding (MOU) with Chinese company CGGC will help this: it may lead to a Joint Venture to develop 2000 MW of electricity at the mine mouth. There is a long way to go but it is a step in right direction. He thanked shareholders for another year of continuing commitment. The first item of business was to receive the company’s annual accounts and directors’ report. Michael Tang proposed only to take questions on the accounts and to deal with questions on the report at the end of formal business. I questioned this: how can shareholders vote to accept a report without having the opportunity to ask questions about it? It is very bad practice. However, the board wanted to do it that way and I could not be bothered to object further. Michael Tang pointed out that he held 17.9 million proxies, so there was not much point voting my ten shares against. We pressed on to the other items of formal business. Resolution 3 was to re-appoint James Hobson as a director. James Hobson said he had spent ten years in East Timor and found that NGOs were not effective, and that in order to develop, the country needed jobs. It was because of development opportunities for jobs that he joined GCM. Sam pointed out that seven different UN representatives had said that over 200,000 people would eventually be displaced by the Phulbari project due to reduced access to water. Did this not affect James Hobson’s view? James Hobson replied that the directors had gone to Brussels and talked to the UN Special Rapporteurs and they had acknowledged that they had done no due diligence and had simply passed on information they had received. “It was a bit of a stitch up.” They had also warned that if GCM went public with the information at that time, it would affect the company’s public relations. “I am aware of the project and the impacts and benefits, and I think it would be an enormous benefit to the people of the area,” he said. Gary Lye cut in from Dacca. “The local politics is the local politics,” he said. (With this penetrating level of analysis, he could perhaps get a job on Theresa May’s front bench.) He said that there are “a couple of rival groups vying to be in power locally.” On the incident in 2014 (when his car was attacked), “we were up there to talk to the community in terms of giving them feedback on the benefits of the project.” The community was interested in hearing from the company details of compensation and job creation. After a meeting of more than 300 local people, a couple of rival groups came to the company’s office and did some vandalism in the presence of local police authorities. These were isolated incidents, and there is good community support: more than 55 community representatives are working with the company’s team. The community wants the project, wants jobs, wants to see development, and is disappointed that nothing has happened. Gary Lye said the company had done a survey and found that over 80% of people were in favour of the project. More than 300 people, community leaders in particular, came to talk to him, and groups came the evening before who also asked questions. Only 50 to 70 had turned up to protest at the office. They were minority groups with vested interests and their own opinions, and in this case they had tried to impose their views on others. The company has got surveys, and the fact that people continue to talk to them is an indication that the majority of the people want them. The MP for the Phulbari area is in favour and he enjoys similar feedback from the community. He is a key supporter of the development of the area. He sees the benefits that come from the nearby Barapukuria coal mine and looks forward to larger scale development which will bring many jobs to his area. The Chairman said that we should move on to the business at hand, so we remained unenlightened by any possible response from Gary Lye. The Chairman retorted that the business at hand was to vote on the resolution, the re-appointment of James Hobson as a director. Unsurprisingly, the resolution was carried. All the other resolutions were passed without discussion, and the formal AGM was closed. Then the Chairman allowed the questions that should have been part of the discussion on Item 1. A shareholder said that the Chairman had assured the meeting that the Government of Bangladesh was steadfast in its aim of generating electricity from coal. It was steadfast also in its failure. Had there been any change of attitude in the past year? GCM had offered the opportunity to generate electricity and raise living standards for years. Had the government changed its attitude? Michael Tang said this was a good question. In the past year or so, the Government of Bangladesh had awarded a number of sizeable coal fired power plants to Chinese, Japanese and Indian entities. The government had continued to push forward its plan to power up the country. While GCM faced protracted delays with its project because of opposition in certain quarters, and the fact that it had become a political issue, in the last couple of months the Prime Minister had publicly promoted coal-fired power plants and open pit coal projects. She had made a live telecast to the nation referring to projects in Germany that encompass open pit coal projects that are larger than Phulbari. She was trying to convince detractors that open pit coal mining, if undertaken properly, would safeguard the environment. The shareholder suggested this was a 180 degree change of direction and the Chairman agreed, saying again that the Prime Minister of Bangladesh had gone on record to promote the Phulbari project. In late August she had made a nationwide television broadcast where she had held up images of open pit mines in Germany. She said that coal fired power plants require affordable coal transport, and placing them close to the mine mouth or to a river is good. Supercritical plants emit 40% less carbon and sulphur than sub-critical plants. She stated that there were seven power plants in the North Rhine area of Germany, located close to open pit mines. People live in the area and they construct power plants there. There is a large hillock beside the mine where debris is dumped, and a lake in the final area of the pit which has been turned into a tourist destination. There was some laughter from activist shareholders when Michael Tang said that a lake in the final area of the pit had been turned into a tourist destination. Michael Tang added that the planned Phulbari open pit would be smaller than the German coal pits. Another shareholder pointed out that for many years the company had been talking about seeking a meeting with the Prime Minister of Bangladesh. Had this yet taken place? Had anyone from GCM met with Sheikh Hasina? Zahanara Rahman asked for their names. Michael Tang gave no answer. A shareholder said that the original scheme submitted 10 years ago included a plan for a mine mouth power plant, run by a British company. There was no excitement about that. Why so much excitement about the MOU with a Chinese company? The Chairman said that the reason the company had signed up with the Chinese state enterprise was that the trend in Bangladesh was that the government seems to want to work on a government to government basis on large-scale infrastructure projects. Another shareholder asked whether the Prime Minister’s change of attitude had been caused by the 1,000 deaths at the Rana Plaza factory, which he said was partly caused by lack of electricity. Michael Tang replied that the primary reason for the change of attitude was simply that the country lacks power. Half the country has no electricity and this does not bode well for development and progress. Zahanara Rahman once again demanded the name of the government representative that GCM had spoken to. Michael Tang said it was a private meeting. Zahanara, referring to an article in the Daily Sun newspaper from 22 September this year, said that the Government of Bangladesh would not approve any more open pit mines. She accused Michael Tang of lying and asked whether he had met with the energy minister. Nik Raof Daud said that the Chairman’s description of the statement from the Prime Minister was factual. Zahanara repeated that she wanted the name of the government representative with whom the company had met. Nik Raof Daud repeated that what the Chairman had said was factual: the Prime Minister did make those statements. It was a matter of fact and record. Secondly, what the Chair had said about the MOU was factual. The board did not speculate beyond that. All they had said was that the Prime Minister had made certain statements, and the compay had made a statement about entering into a MOU with a Chinese company. Zahanara asked whether GCM and the Chinese company had gone to the Energy Minster. She said that she could not go to another country and open a coal mine without going to the energy minister. She wanted to know the name of the person with whom the company had met. Michael Tang said that the Memorandum of Understanding was a private agreement to evaluate the feasibility of undertaking a power plant. The company had not stated that the government would approve the project. He said he would like Zahanara to retract the statement she had made that he was lying. He asked how many shares she held. Zahanara replied that she did not have to tell him that. There was then an argument about whether or not Zahanara should say how many shares she held. Zahanara returned to her point about press reports about GCM harassing local activists by filing a case in the local court for financial losses. The Chairman said he had not come across any such articles and asked Gary Lye to comment. Gary Lye replied that the people who had attacked the company’s office did so in the presence of police, and charges were framed by the police, so they are criminal charges. To secure recovery of damages, he said, there is a second phase, which is a civil claim for damages, and that comes in three main categories – physical damage to property and vehicles, then extra costs that the company has incurred to do its work (employing different procedures at additional cost), then a component to do with reputational damage. This was in front of the court and it was up to the court to make decisions. Zahanara said that when she had visited Bangladesh last year and again in May this year she had heard from reliable local sources that GCM was recruiting local drug addicts to attack local people who do not support the company. Was that true? If so, why was GCM recruiting drug addicts? Gary Lye said that the question was “really out of order.” No answer was given. The shareholder asked whether Phulbari was better placed than other coal deposits in the area. Michael Tang replied that it was the number one choice. “There are other areas with coal but they are deep underground and compared to Phlbari less studies have been undertaken in respect of these sites. Phulbari ranks at the top as the least costly of any deposit in Bangladesh.” His evaluation of 5 to 6 likelihood was based on this. The Chairman said he would take Rashedur’s views into consideration. But he did not attempt to answer any of the points Rashedur had made. A shareholder said that the Sundarbans coal-fired power plant project was controversial. Phulbari was also controversial. The Sundarbans project was controversial because of environmental matters. Why is it taking so long for government to say ‘go ahead’ with Phulbari, given all the benefits, providing GCM had supercritical means of reducing emissions? The Chairman said he could only speculate why – perhaps due to legacy issues. The Sundarbans project was a fresh project with no issues from the past, and it was easier to promote. Gary Lye said that Phulbari had “issues about what happened in the past” (presumably referring to the massacre of anti-mine protesters in 2006) but it was not contested that there is a coal deposit of very high quality, higher than what could be imported and plenty to produce electricity. It would be better to use it than imported coal. Petro Bangla was responsible for the supply of energy for the country’s needs. Its published figures from last year show gas reserves depleting so fast that by 2023 there would be no more gas for large-scale power generation. In that context, domestic coal for Bangladesh has become something worth looking at seriously. Before 2010 the government thought the country was floating on gas but now they know it is more complicated. But it takes many years to set up power plants or get mines into operation, and now there is concern that in the early part of the next decade Bangladesh will run into problems. There is a problem with the ability to provide energy. The GDP growth rate of 6% shows the country is just keeping ahead of inflation. To improve this they must introduce 1,000 MW of power every year, and this is not happening. That is the context. In 2010 the government came to the realisation that the country needed to source different fuels. The shareholder commented that what is holding up Phulbari is political not commercial, and the Chairman agreed. The shareholder asked what the company was doing to change the government’s mindset. The Chairman said that the company had come a long way now that the Prime Minister had endorsed open pit coal mines publicly. A shareholder asked whether the company had to keep the government informed about its conversations with the Chinese company. Did it have to have approval for the MOU? The Chairman said that it did not, under its contract with the government. The MOU was purely about evaluation by the two parties. If the matter progressed GCM would engage the government with the corporate partners, at this point CGGC. I said that on page 4 of the company’s Annual Report claimed that if the Phulbari project went ahead, ‘farmers will enjoy improved productivity and incomes through support of the Project’s Agriculture Improvement Plan and the water made freely available for irrigation.’ It also claimed that the Company is committed to the principal that no one will be worse off as a result of Project development. Compensation to those affected will, where appropriate, be a mix of measures such as long term livelihood restoration support, replacement homes, retraining, employment and financial packages.’ I said that similar claims and promises had been made by the Cerrejon Coal Company in Colombia, a company owned by three large mining multinationals – Anglo American, BHP Billiton and Glencore – with enormous experience. There had been serious problems with the company’s community relocation programme, and new productive projects had often failed. Conflict and community division had been caused, and there was animosity against the company as a result. The multinational owners freely admitted that they had not got everything right. If large, experienced mining multinationals cannot get community relocations right, how could a small company such as GCM, with no mining experience, be confident that it could keep the promises made in the Annual Report? Shareholder Brian Mooney, who worked for the company in the early stages of the Phulbari project, commented, “That was a good, well informed, important question.” It’s a shame it didn’t get an answer. Of course, the company could have claimed to have avoided the flight out of concern over climate change, but that rings hollow when you’ve been trying to open a vast coal mine for the past ten years. Zahanara said, “I will be in Bangladesh next month and I would like to go to Phulbari with Gary.” The Chairman undertook to give her Gary Lye’s contact details. A shareholder asked for details of the MOU, and whether there was a completion date. The Chairman replied that he could not say when the company would conclude its evaluation and discussion on the terms of the agreement, but both parties had been working to progress it and they hoped to conclude within six months. Another shareholder said that he had lived in Southeast Asia and had invested in GCM as it had seemed the most ecological project available (which struck me as a trifle odd, frankly – I could have directed his attention to many projects more ecological than enormous open-pit coal mines). He said that the other thing which had pleased him was the promised “project sharing”. (I assumed he meant profit sharing.) He asked Gary Lye to update us on it. Gary Lye said he was not sure what was being talked about. The shareholder said that he had thought that part of the project’s progress was “the adoption of PSC.” James Hobson said he was not aware of this. Gary Lye said he was not aware of it either. This did not sound promising to me. The shareholder said it was about profit sharing, so that locals would share in the benefits. Gary Lye said the company had developed a plan about compensation and restoration of livelihoods and preferential employment and training, improving agriculture in the area. He said he was not sure what else was intended by the question. The shareholder explained that the acronym was PSC and that he thought the company was promoting it as part of the way forward. Clearly the board did not share his evaluation. Gary Lye said that various funds had been set up to support people affected by project. Sam Brown asked for specific numbers. Gary Lye said that numbers were in the resettlement plan which is on the company’s website. The important thing, he said, was that these funds had been set up to ensure that livelihoods improve and nobody would be disadvantaged by the project. The overview committees are looking at how this is all handled. Rashedur asked whether the company actually had a licence to dig the mine. (This is an annual question.) The Chairman replied that GCM has a binding contract with the Government of Bangladesh and that under administrative rules a go-ahead has to be issued by the government, and the company is waiting for that. Zahanara said that she understood that party leaders had committed to not giving a licence to anybody at Phulbari. Why did the company keep on saying it had a binding agreement? She said that whenever she went to Bangladesh she talked to people who say they will not allow the project to go ahead. Rashedur added that he had heard rumours that the government might give the licence to Tata. Is there a competition or discussions going on around licencing? Brian Mooney suggested that the Chairman go through how the licence came from the original grantees so that shareholders could understand the history and see where it is. The Chairman said that the first company that secured the contract was BHP Billiton, which secured it from the BNP (Bangladesh National Party) government. GCM subsequently acquired the contract from BHP, and it was endorsed by the Awami League government, so there were two governments endorsing the contract. Within the contract is a licence for mining under certain conditions. In the company’s view, GCM has fulfilled all these conditions, and it is now for the government to issue the go-ahead. GCM’s position is that it has a valid mining contract with the government, and the government happily accepts its licence fees. The Chairman brought an end to the discussion without Gary Lye replying to Sam’s question. Michael Tang said he would be very happy to buy all her shares. He said she would also be welcome to visit Phulbari. Brian Mooney said that much shareholder money was invested in the project to prove the resource, and asked the Chairman how much. Michael Tang said that “20 million” had been invested. I took it that this meant 20 million dollars but Brian Mooney was unsure whether it was dollars or pounds. But before I could clarify the point, the meeting fizzled out. After the meeting, one of the shareholders told me that he thought the Chairman’s suggestion that there was a likelihood of 5 or 6 out of 10 that the project will be approved within a year was very optimistic. If only they would just give up on it!